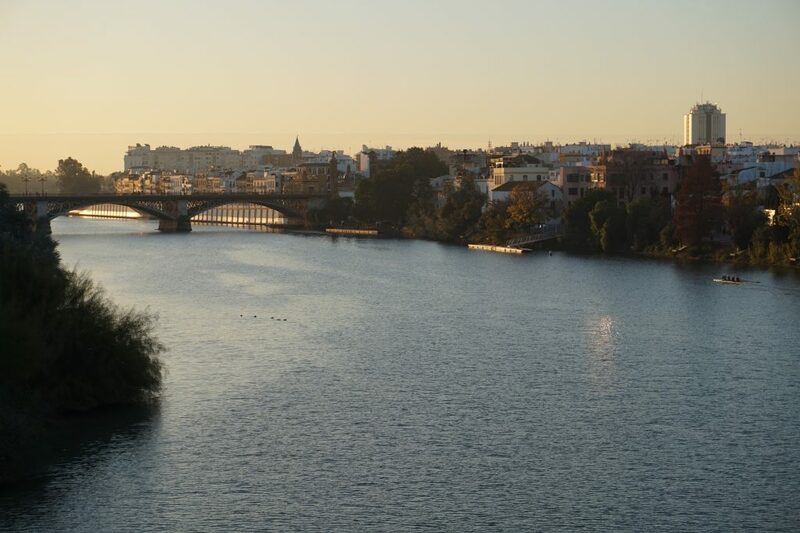 Throughout history, the Guadalquivir River has been the reason for as well as the bane of Seville’s existence. It is the second longest river in Spain, travelling 650 kilometers across the width of Andalucia to finally arrive at the Atlantic Ocean, just above Cádiz. It brought the city water, trade, clay, protection, sustenance, access to the sea and much more. But let’s not forget that the translation from Arabic means “big river” or “big wash”. Repeatedly during the centuries the river would flood and burst its banks, causing huge damage and destruction in the city. fall mainly on the plain! This division meant that Triana developed its own character and personality, customs, festivals and intense self-pride. Today you can still feel the difference in identity between thetwo riverbanks. It was thanks to the river that Seville was allowed to live its Golden Age when it was named exclusive trade port with the Americas between 1503 and 1717. The logical choice would’ve been Cádiz. But jutting into the ocean at the end of an isthmus, the city had the shape of a lollipop, easily attackable from 350 degrees. 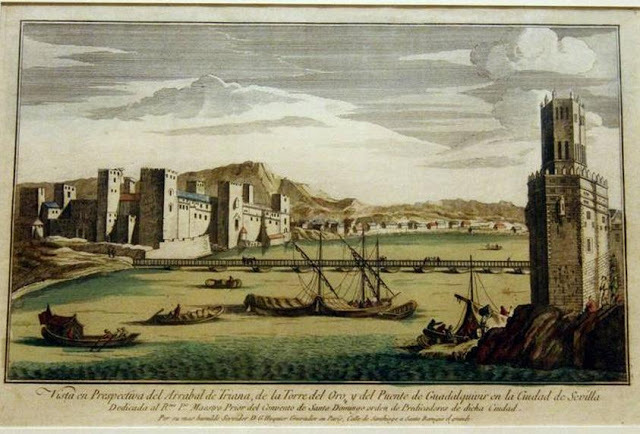 Other seaside ports were surrounded by noble lands, worrying the crown that their noble friends would end up getting too big a cut of the wealth. So Seville was the chosen port. Money and affluence poured upriver, making it the most important city in Spain and possibly Europe. Even today you can see the mark left on the city by that period of wealth, with numerous buildings springing up to cater for all the trade. Watching Easter Week in style from a private boat! If we fast-forward to the current day, we see a city that has greatly dwindled in terms of economic presence. But that has converted itself into a place of incredible elegance, beauty and enchantment. One of our main trades today is welcoming tourists from all over the world who marvel at what they see when they visit our city. 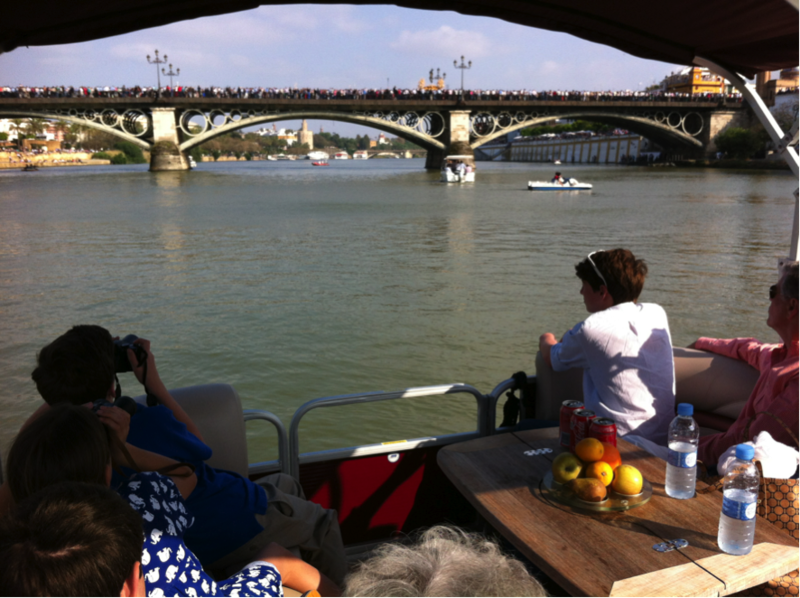 Other important European cities such as London, Paris, Budapest and many more have made their rivers appetizing attractions for their visitors. But its only recently that we are rediscovering the potential and importance of the Guadalquivir River. After Córdoba, Seville is the city with the hottest summer in Europe!! Our river should be the absolute protagonist of our warmer months, but up until now it has been pretty much ignored. Finally we are beginning to see more riverside cafes and kiosks open up, top restaurants, running paths and bike lanes, rowing clubs, river clubs, an Aquarium, even a “Seville Eye” ferris wheel has appeared. Currently building work is taking place along the main stretch of the riverbank in front of the bullring to create a center specializing in flamenco, gastronomy and other such attractions. Personally I feel that the most enjoyable stroll in the city is along our riverbank. We’ve taken guests kayaking, paddle boarding, running, cycling and walking along the river. One of my absolute favourite ways to see the city is in the comfort of the 10 seater luxury boat that we arrange for guests. You can’t beat a guided cruise of the river, watching the sunset with a glass of wine in hand! We even invite one of our friends along who is a professional flamenco guitarist! 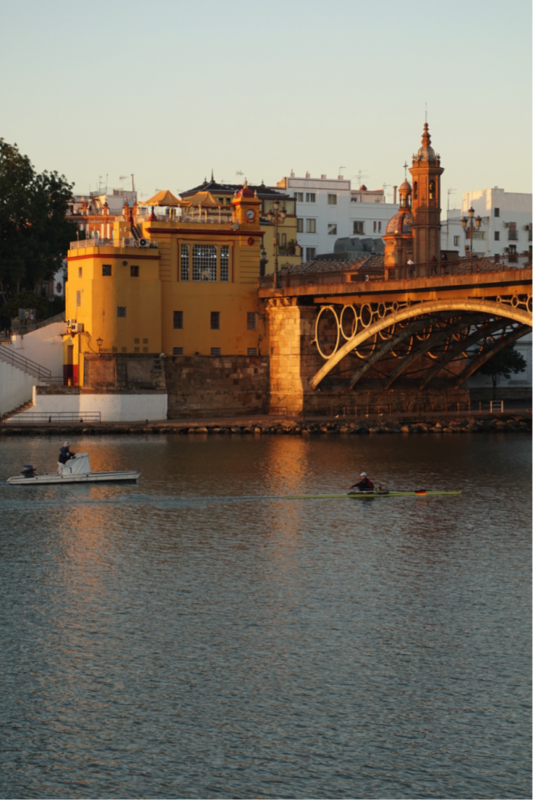 The Guadalquivir has a very bright future in Seville. We’re enjoying it to the max whilst it lies tucked away, partially out of sight to many visitors! I strongly recommend you make the most of it on your next visit to Seville! Posted in Andalucia, Sevilla, Spain and tagged guadalquivir, river, seville, triana.